When we first brought Edison home, he was a bit...much. As a 9-month-old puppy at 60 pounds, we knew he would need a lot of work, so we got started right away. We put him in a training class and began socializing him as much as we could. We took Edison to Mud Puppies to observe a social hour. That was the moment we realized what a huge undertaking this dog was going to be. He was like a wild beast on a string. We could barely keep him under control. Any time another dog looked at him, he would start to make crazy noises and prance around on his back legs. After 2 or 3 visits of this, we would begin hearing “uh oh, here comes Crazy Ed” upon our enterance. But don’t worry...it’s always been out of love. Update: The folks over at Love and a Six-Foot Leash are doing a holiday fundraiser for The Schrodi Fund - a scholarship fund to aid those with dogs with behavioral issues get the training they need. We were so lucky to be able to get Ed the training he needed early on and avoid his behavioral issues becoming major problems. If you're considering holiday giving, think about donating a few bucks their way - and be entered for some pretty fabulous prizes. Each month, Tesla & I go to the Blasco Memorial Library to meet up with some of her friends – both human and canine. Kids from the City of Erie community come to participate in the Therapy Dogs Reading Program at the library where they spend about an hour practicing reading to each dog. The dogs help children to read because they have “non-judgmental ears.” When reading aloud to adults, kids tense up and are reluctant to try if they’re not confident in their abilities. But when reading to a dog, kids are much more comfortable. We’ve been participating in the program since January and – while we can’t take credit for it – we’ve noticed not only am improvement in the kids’ reading abilities, but also their willingness to try. Tesla says, "T is for Tesla!" Tesla loves seeing the kids and they love her – many of them have pitbulls themselves and have a great connection with her. I love showing them how responsible ownership makes for a well-balanced, loving dog. 3) Edison getting some quality crate time – he’s still in his probational period. we decided to take a long walk before the festivities. We went to the parks in my hometown on the campus of Waynesburg University. 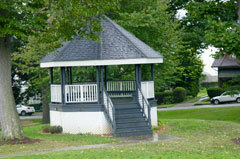 There are 5 parks that each take up a block, West Park, Ritchie Park, College Park, Monument Park, and East Park. Each has its own uniqueness. These parks were, at one time, used for pasturing farm animals – all permitted to run at large for decades! We visited 4 of these. All the parks are home to tons of squirrels, which Tess & Ed found fascinating. 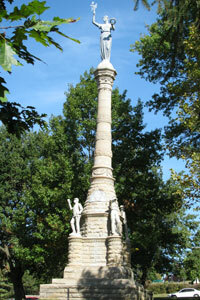 We we started in Monument Park where there is a Soldiers & Sailors monument honoring those who fought in the Civil War. Ed had a fun time climbing up and down on the fountain. In the summer water flows through it, but in the fall it just holds leaves. Meanwhile Tess was too busy being gorgeous. After our break, we headed to Ritchie Park. Also known as the “Gazebo Park,” this park has...well, a gazebo. The pooches were too interested in walking to pose in the octagonal Victorian bandstand. Throughout each park are benches. This past summer, 2 volunteers painted each of the 10 benches in the park. Here is Tess posing on a musical bench...the seat is piano keys! We then made our way to the last park, West Park. This park has a small bridge that, when I was a kid, I was sure lived a troll. It was a beautiful fall day and was one more reason to be thankful. WARNING: This post in long – but necessary in order to talk up this wonderful place! I realized yesterday that we were totally out of treats. Not wanting to cause a coup, we made sure to head to one of Edi & Tess’s favorite places: Mud Puppies Self Serve Dog Wash.
Mud Puppies is a little shop at 3867 Peach Street in Erie that, in its simplest form, is a place to take your dog and give him a bath – without worrying about the moment he shakes off and soaks your entire bathroom. But Mud Puppies is so much more than that. 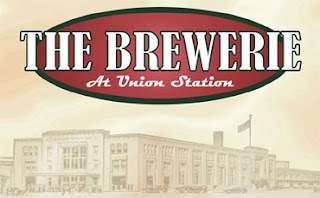 We’ve taken the dogs to get baths here several times. Correction – we’ve taken Edison here several times. Since Tess is terrified of the bath, she’s gotten a bath here maybe 3 times. The owner, Kim Hessong, understands Tess’s (irrational) fear. She encourages us to stop in throughout the week and desensitize her to the tubs – walking back and forth, jumping in and getting a treat – without actually getting a bath. We did give Tess a bath last night, but it wasn’t without soaking both Sam and I and at least one of their employees. Edison, on the other hand, does fantastic in the bath. He jumps in with the promise of a treat and waits patiently while we wash – even standing still while we blowdry his coat. Since our dogs have such short fur and don’t need professionally groomed, we have little occasion to see the groomers they have on staff should you have a long-coated pal or are just low on time. However, we recently discovered the beauty of dremmeling the dogs’ nails: we can get their nails a lot shorter; we don’t end up with the sharp, jagged nails cutting our legs for days; and it’s a lot less traumatizing for Tesla. Best yet, we get to interact with the fantastic girls from the groom shop. We love Melissa and Brandy. They, of course, do a great job on their nails, but they are so great with the pooches. They understood that Tess is still working on letting people touch her feet and that Edison is starting to get over trying to nip people when they grab his. Brandy was even understanding of our foster beagle who made every attempt to blow out her eardrum during his pedicure. At Mud Puppies, you can find all sorts of goodies for your canine friends. With a huge selection of all-natural treats, you can feed your pooch as well as you feed yourself. Our pups love Grandma Lucy’s Pumpkin treats – they’re made with human quality ingredients and are actually really tasty. Mud Puppies also carries Premium Tuff Lock collars and leashes. These fantastic, everyday collars are durable – and backed by an unconditional lifetime guarantee, even if your dog chews it! We’ve already taken advantage of the guarantee when we found Edi’s collar clip had broken. 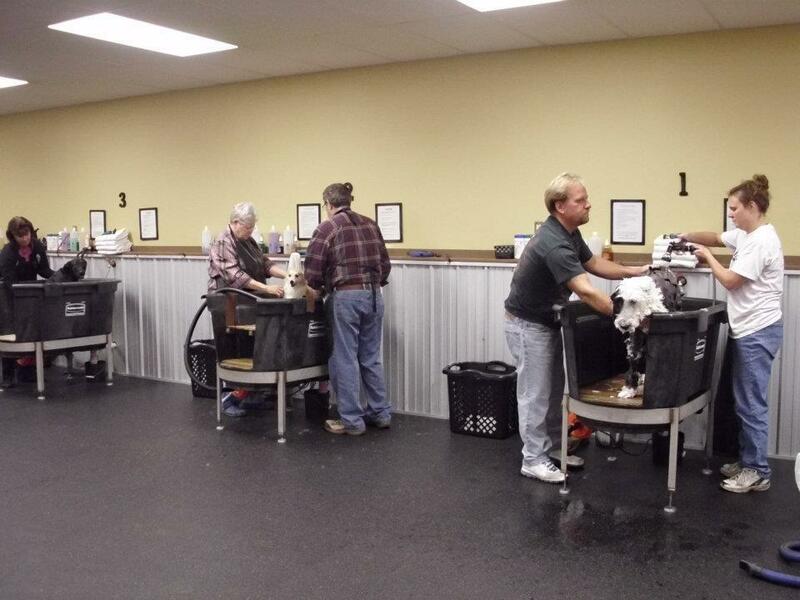 Mud Puppies offers several different classes that you and your pooch can take. We’ve not had the opportunity to try out any of their obedience classes, but we’ve heard good things. Edison and I started an agility class there – where you learn the obstacles, good technique, and safety considerations to prepare you for a full-blown agility course class – until our trainer broke her foot. Boo. Kim offered us money back, store credit, another class – we opted to keep the deposit and sign up for the next one when the trainer is all healed up! One of our favorite things about Mud Puppies is the opportunity for socialization. 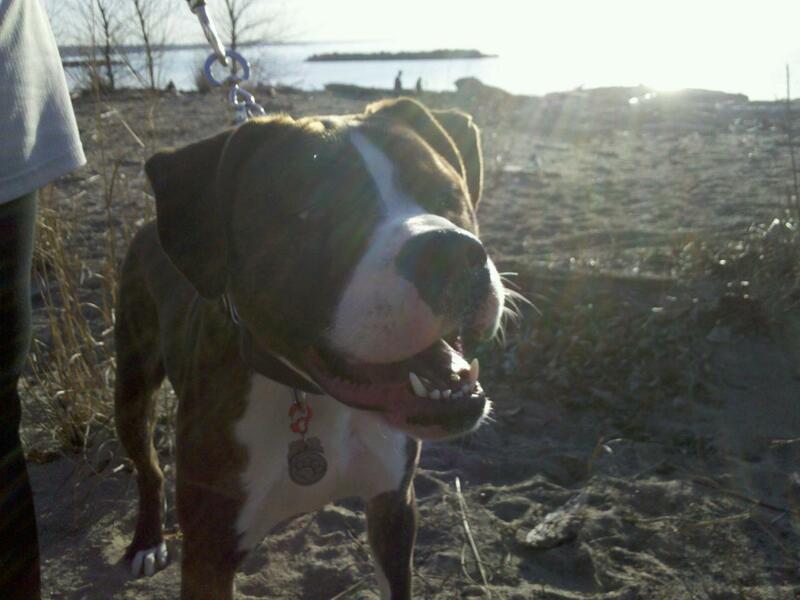 Edison will never be a dog park dog – and that’s okay! – but we still want him to be well socialized around all types of people and canines. Mud Puppies offers 4 opportunities a week for direct socialization (in a controlled and aware environment) and ample opportunities for passive socialization. Thursdays (1030-1130 & 430-530) you can bring in your “large” dog (30+ lbs) for Yappy Hour to play with 10 canine friends in the training rink. All humans are aware of their dogs limits and signals. Since the play group is so small, it is easy to keep an eye on your dog and all the other dogs in the rink. On Fridays (530-630) you can bring in your “small” dog (<30 lbs.) for Yippy Hour, a smaller version of Yappy Hour. 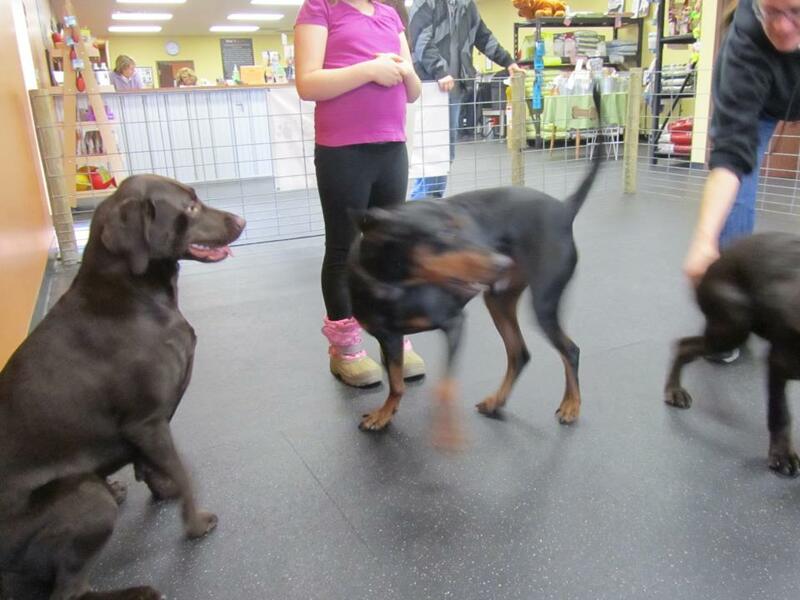 Even though Tess is just over 40 lbs, Kim lets Tess attend Yippy Hour because she is so much more comfortable with the smaller dogs and gentle enough when she plays with them. 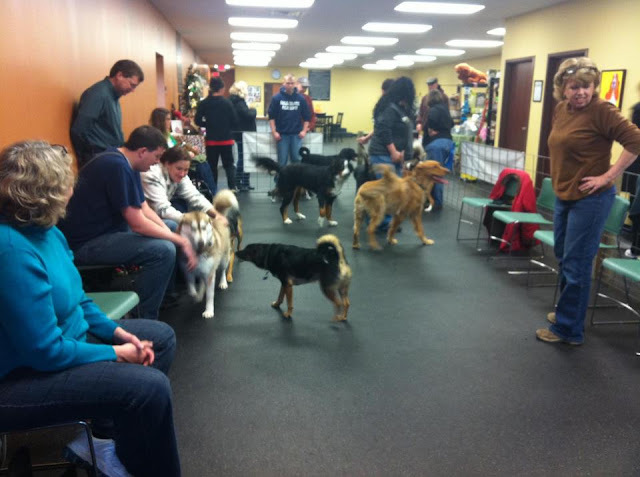 On Saturdays (1030-1130 & 430-530), all dogs are welcome for Social Hour. There are a few smaller dogs that run with large dogs that come, but generally it’s a large dog group. All owners wanting to bring their pooch to Social hours must attend the Socialization seminar. This 1 hour workshop teaches dog owners the cues to look for when dogs play – good play techniques, red flags, and tips to help your dog understand what is acceptable and what is not. When Tess started going to Yappy Hour, she spent most of her time hiding underneath the chairs. 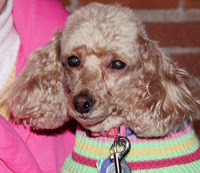 Through the confidence boosting of Yippy Hour and the exposure at Yappy Hour, Tess became a confident socialite! Edison has always been too rambunctious to take into the rink, but don’t think he doesn’t get a chance to socialize! We take him and stand of the outside of the rink and give him indirect exposure to the dogs and allow him to observe play. Additionally, he gets tons of contact with different types of people and works on his greetings (which is one of the CGC test items). All dogs must have vaccination records on file and all humans must attend the Socialization seminar offered once a month. We love Mud Puppies and are so excited to see more of the positive impact it will have on the Erie community in promoting responsible dog ownership. Don’t forget: November 24th is Small Business Saturday – a great opportunity to get some holiday shopping done and support businesses like Mud Puppies! Stop in and pick up a gift for the dog lover in your life. When I was looking to adopt a dog, I had no intention of adopting a pitbull. I wasn’t a “dog person” then, so I knew very little about dogs. But I did know that as a then-renter a pitbull would make it difficult to find a new apartment should I need one. After bringing home this little, skinny pitbull, I began to read. I read anything I could get my hands on. In my research during my preparation to adopt a dog, I came across information about the AKC’s Canine Good Citizen’s Test. On pitbull advocacy websites, they write about how important it is for (dog owners in general, but especially) pitbull owners to have their dog obtain their CGC Certificate. I was determined to have the best behaved pitbull dog ever. And so we began. 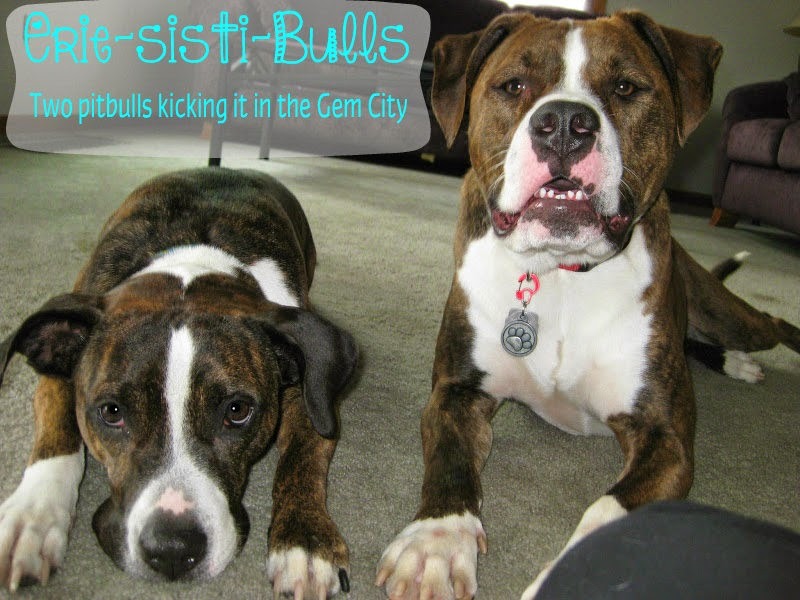 The reality of it is that the CGC is – in my eyes – mandatory for bully breeds (Edison is working hard to get there). 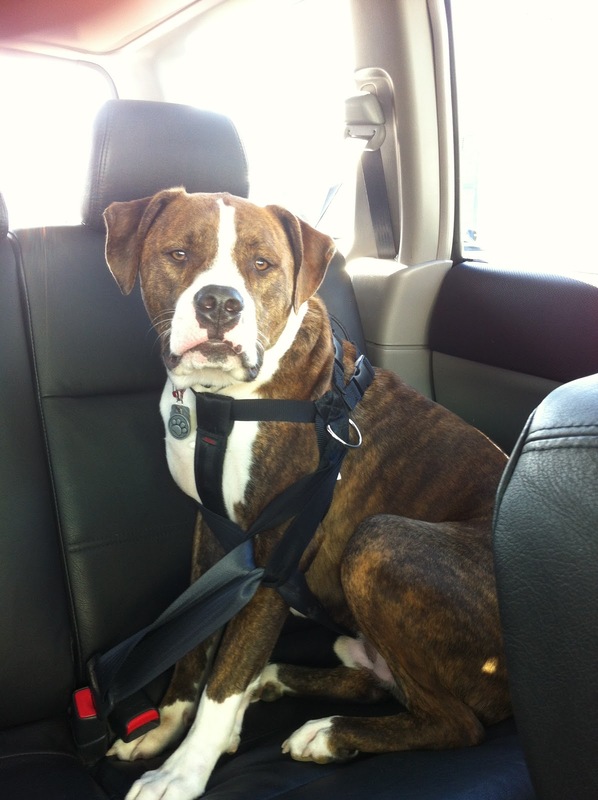 It denotes that your dog is a safe and stable member of your community. 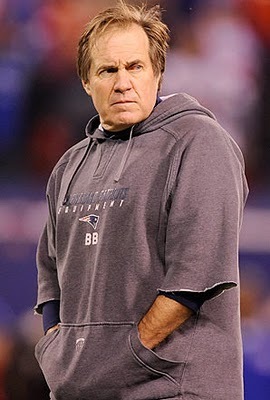 I’ve always liked having it in my “back pocket” in case I come face-to-face with a naysayer. For rescue dogs especially, it is a badge of resilience, a stamp of approval. It’s an important step for bully owners to show that they are committed to being responsible owners. There are tons of trainers out there that do obedience classes geared specifically towards the CGC and help you prepare for the exam. If you’re thinking about going for it (especially all you bully owners), DO IT! 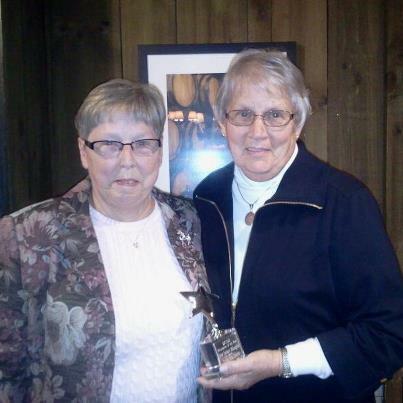 Friday marked the 1st Annual Therapy Dogs United Volunteer Recognition Dinner. After passing her therapy dog exam in January, Tess became an official Therapy Dog of TDU. The organization is entirely run on volunteers (in both human and canine form!) that put A TON of time in throughout the course of the year. Although still a relatively young organization – less than 5 years – TDU has over 300 teams and visits over 50 facilities throughout the year. The dinner recognized all TDU volunteers, but the highlight of the evening was the announcement of the 2012 TDU Volunteer of the Year Award . Or should I say, volunteers. Sister Rita and Sister Carolann...and Rusty, too! My calendars finally came in the mail! Let’s put it how it is: I’m obsessed with calendars. I need to know when and where I am supposed to be somewhere. Given this obsession, I prefer to have my schedule documented on multiple calendars: work Outlook calendar, phone calendar, desk calendar, and – my favorite – cute wall calendars. Shortly after I adopted Tess, I began scouring the internet for pitbull resources. I came across The Unexpected Pitbull. For the past 2 years, I have ordered their calendar. Not only do i get to see a super-cute pitty face every day of the year, but it supports a great cause. 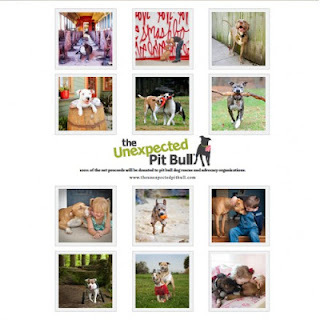 The Unexpected Pit Bull is a not-for-profit organization that creates, markets, and sells merchandise celebrating pit bull dogs. We donate 100% of our net profits to pit bull rescue, education, and advocacy organizations in need of support. Our Mission: By illustrating stories of pit bull dogs sharing their lives with a variety of people and animals, we hope to inspire a better understanding and appreciation of these dogs and combat the negative stereotype held against them. The other calendar that just came in is my “office calendar” – Little Darling’s Pinups for Pitbulls. PFPB is a certified 501c3 not-for-profit organization whose mission is to educate people about the history, temperament, and plight of the pit bull-type dog; raising awareness to rally against Breed Specific Legislation (BSL) and Breed Discriminatory Laws (BDL). PFPB’s goal is to restore the image of the pit bull-type dog to its former reputation of America’s companion animal, war hero, and family member. Founder Deidre “Little Darling” Franklin utilized her background in modeling and education in fine arts to create a calendar like no other–eye-catching pinup girls and their pups, paying close attention to detail and era appropriate style along the way. The best part is that they come out just in time for the holidays and make great gifts for your dog-loving friends! I’m excited to put these up in 2013!